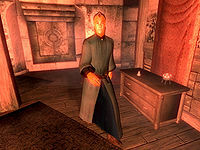 Henantier, an Altmer warlock, is an Associate in the Bravil chapter of the Mages Guild and a very good friend of Kud-Ei who will ask you for help to tear him from his dreams in the related quest. His 'dreamworld version' has a very simple schedule: he will wander around the second floor of his house, the 'dreamworld hub', not even eating or sleeping, until you have found all four elements. After the quest, he will live a much more peaceful existence. He will sleep in his bed from midnight to 6am, when he wakes up and eats a three-hour breakfast. He will then proceed to enter Bravil's Guild Hall, where he will spend six hours wandering and talking to Kud-Ei and the other guild members. 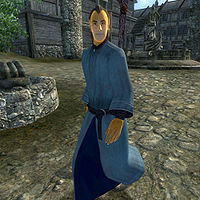 At 3pm he will leave the Guild building and wander around the eastern part of Bravil for another six hours. At 9pm he will return to his house, where he will eat dinner until midnight. His garment consists of a mage's robe and a pair of green velvet shoes. He also carries his key, a cheese wedge, and a sizable amount of gold. In combat, he relies on a leveled set of warlock spells. Also, starting from level 5, he will possess a leveled staff of the best possible quality. He is a man of very few words, but his friend Kud-Ei is more than willing to give you some background information on both their friendship and also on Henantier as a person and a guild member: "We were study-mates at the Arcane University and we've come to grow fond of each other over the years. He's always getting himself into jams with the careless ways he performs his experiments, and well, I'm afraid he's done it again. Henantier isn't missing. On the contrary, I know exactly where he is. The problem is he's trapped and there's no way I can free him." and "Well, Henantier's been warned that if he strays outside the Guild rules one more time, he may be up for summary dismissal. The rules say that he isn't to practice dangerous experiments at his home. It must be done in the guild under the watchful eye of an associate. Henantier's never been one for rules, and so he's continued to perform his latest experiments in secret. If word gets out, he'll be dismissed." She will also elaborate on his imprisonment: "Henantier isn't a prisoner in any physical sense. He's a prisoner of his own mind. He's trapped in his Dreamworld." and "Henantier created the amulet to see if he could use his dreams as a training ground to help better himself. It's been three days, and he's been stuck in his dreams. I've watched him all that time, and he hasn't been up at all. The only way to save him is to put on the Dreamworld Amulet and go to sleep. Only then can you hopefully find out what's happened in there." When you enter the Dreamworld for the first time, you will find Henantier standing in what appears to be a dream-version of his own living room, obviously confused. When he sees you, he will utter: "My word! You startled me! Are you real?" or "How did I get here? Do you know the way out?" When you confront him, he will ask: "I've lost my way. This place looks so familiar, but I can't remember how I got here. Can you help me?" Confronted with the fact that he is standing in his own dream, a surprised Henantier will say: "This place is so strange. Dreamworld, you say? It's more like a nightmare. I don't like this place at all. I feel like I shouldn't be here. There must be an exit around here somewhere. I'd explore this place, but I'm afraid I just don't have the courage to do so. How could I be so careless? What's the matter with me? I know I've lost something. Yes, that's it. I've lost many things in this strange place. Would you please help me?" He will then exit the conversation, and stand still, waiting for you to figure out what he has lost. When you get near, he will tell you to hurry: "We must get out of this place!" When approached, he will say nothing but: "Have you found an exit to this place yet? We must escape!" After you have passed all four tests and received the elements, Henantier will keep on going: "Please... help me, I can't remember anything." He is no more helpful when approached: "I feel as though I'll be trapped here forever, and I don't even know why." On the subject of the Dreamworld, his answer will now have changed considerably: "But... how? What you say must be the truth... I feel strange... I can see now what you were saying was no story at all, but the truth, and I'm a fool. I had no idea that the amulet could hold such power over me. I set out to create a way to conquer my failings, but it seems the tables had turned, and they conquered me. I don't know how you did it, but I thank you. Now, we must wake from this dream and take our places in the real world again. Farewell." When you wake up in the real world, Henantier will immediately approach you: "It's good to see you in the real world. I'm indebted to you for rescuing me from my nightmare. I suppose thanks are only a small token of my appreciation. Allow me to reward you for your bravery. I'm afraid I don't have much in the way of coin, but allow me to present you with something that may help in your travels." He will also share kind words for his friend: "Kud-Ei has always watched over me, and it's good to know she cared enough to seek help when I was in trouble." There are two versions of Henantier. The first one (RefID=0002CA3E, BaseID=0002CA35) is the version found in Cyrodiil; the second one is the version found in the dream world. The statistics provided are those for the Cyrodiil version of Henantier. The dream world version's statistics are mostly the same, except his Responsibility is 50 and he is not a member of any factions. Also, the dream world version of Henantier is not essential. However, his death causes the player to also die, forcing the game to be restarted from the last save. Henantier has a whole schedule which is never activated, since it is located at the bottom of his AI list. Following this schedule, he would sleep in his bed from midnight to 6am and spend four hours wandering indoors before wandering around the center of Bravil for ten hours. At 8pm, he would head to Silverhome on the Water and eat there for two hours, before returning home, where he would wander for another two hours before going to sleep.